Last week I wrote a short article about in-app purchases. With the help of two of NerdCubed's videos I illustrated the difference between the original Dungeon Keeper from 1997, and the reimagined version for iPad and Android, and looked at how in-app purchases have completely destroyed the game. We have reached a point in which mobile games couldn't even be said to be a game anymore. Playing a game means that you have fun. It doesn't mean that you sit around and wait for the game to annoy you for so long that you decide to pay credits to speed it up. And for an old geezer like me who remembers the glory days of gaming back in the 1990s, it's just unbearable to watch. If you haven't read it yet, please do. I didn't expect it to get much attention. 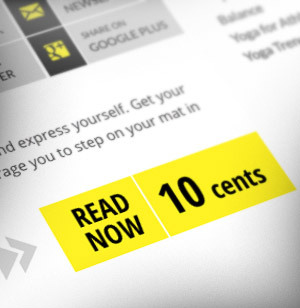 Many people are complaining about in-app purchases, so why should my article be any different? But the comparison between what our world used to be like, and how it has been destroyed by in-app practices seemed to strike a cord. And as I'm writing this, the article has been viewed 546,325 times, with more than 20,000 social shares and thousands of comments on various sites. I think it's safe to say that people really, really do not like in-app purchases. First of all, I don't want to take credit for any of this. I just happened to be at the right place, at the right time, and with the right mix of words. I was not the one who started this, and I just put it into perspective. Also, I don't want game developers to fail. I love games and, like the rest of you, I want the future of gaming to be truly remarkable. And many people misinterpreted my post as if I was saying that in-app purchases are a bad thing. That is not really what I mean. What I am saying is that the current trend of in-app purchasing, and how it is being distorted to be a form of deception and social engineered ransomware, is a terrible thing... and it should be stopped. What EA, for instance, did to Dungeon Keeper borders on criminal behavior (which you will see why below). But the concept of in-app purchases is quite brilliant. When done right, it enhances an already good game by extending its base value. And for the point of the gamer, it functions as a show of support and appreciation for giving them even more awesomeness. One example: I recently finished playing Assassins Creed IV, which is one of best games I have ever played. And after finishing it, I noticed that I could buy an extension called "Freedom Cry" for $9.99... which I did (but haven't had time to play yet). Not only did I willingly pay for the original game, I also wanted to pay them even more because of that great experience. So what we have here are two very different types of in-app purchases. On one hand, we have the type of in-app purchases which are based on making games so awful to play that people feel forced to pay to just suffer less. 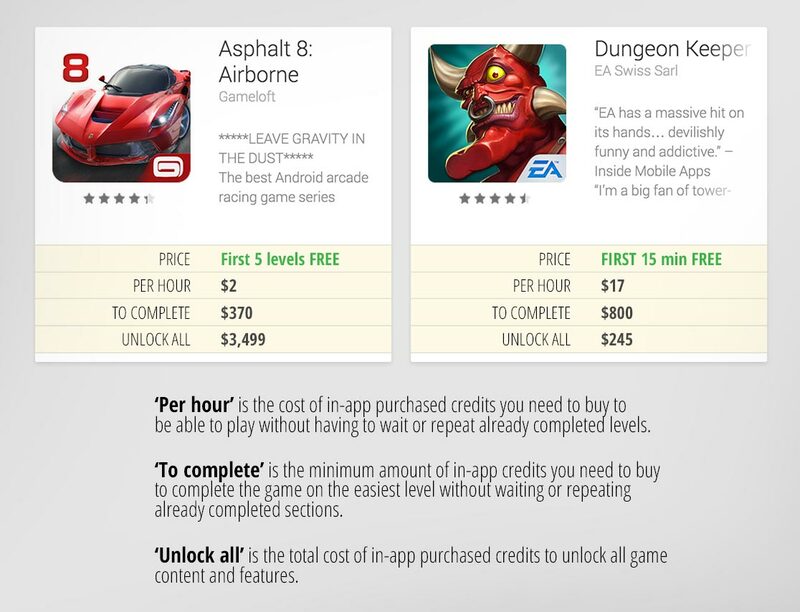 This is what EA did to Dungeon Keeper and it's the type of in-app purchases which are sadly dominating the mobile app stores. These type of in-app purchases are absolutely dreadful, because they are based on a deception, holding people's time hostage, and are socially engineered to function the same way as a narcotic. And it must be stopped because it's destroying all levels of trust and killing the industry as a whole. On the other hand, we have the value based in-app purchases that are designed to enhance an already brilliant experience, extend your game beyond its original scope, give you the freedom to explore different story lines than just the main one, and generally speaking just make everything even more awesome than it already is. In other words, it doesn't try to slow down your game. This type of in-app purchasing is something we should support in every way possible. I want to pay for these in-app purchases because, not only do they give me more value, but by paying I can also show my support to the game developers who are fighting the good fight. You see the difference? One is based on destroying games, the other is based on adding even more value. One should be stopped, the other should be loved. This is what people want... not! Other people complained about the 'pay' part. For instance, many said they would only pay for 'cosmetics' but not game play, which is weird. Take Assassin's Creed. I will happily pay for the Freedom Cry DLC, but I cannot come up with any reason why I would want to pay $1 for an extra set of sails when I already have 20 to choose from in the full game. And finally, we had the gaming developers (many of the good kind), who in frustration argued that they had no other choice, because people won't pay upfront anymore. They also expressed concern that the gaming industry isn't making any money, despite the fact that the gaming market is now worth $66 billion dollars worldwide, and expected to reach $76 billion in 2017. Those are all valid concerns, but they also completely miss the point. What's happening here is that people are no longer capable of differentiating between good or bad. They simply assume that since some games are using in-app purchases that are detrimental to your game play, and all forms of game play must be free. That's a terrible way to look at things, and it has nothing to do with the real problem. The real problem is something much simpler. It's about the deception between what is being offered and what people get. The real problem is this inherent lack of trust. If we fix that, we can also fix all the other problems. The problem here is that the taxi driver offers her a free ride, but he only gives her a free wait. There is a deception between what is being offered and what is given. In the country I live in, we have a law that states companies cannot use deceptive marketing and sales tactics. 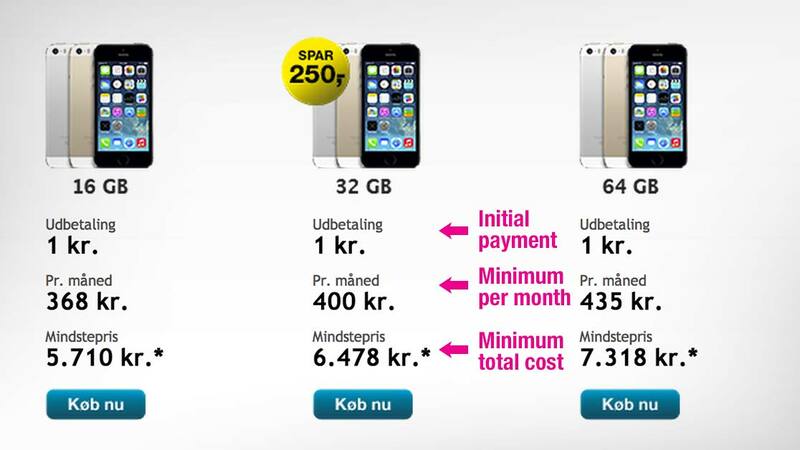 For instance, a phone company cannot offer the new iPhone 5S for $1 without also making it clear that this price is only possible if people sign-up for a one-year contract. They have to be honest about the real cost. This is the law in my country, and this way there is no deception. You don't end up buying a new iPhone for 1 kr (about 20 cents) and then discover that in order to use it you also have to spend 6,477 kr ($1,170) on in-app purchases. This is what we are missing from the mobile gaming world. 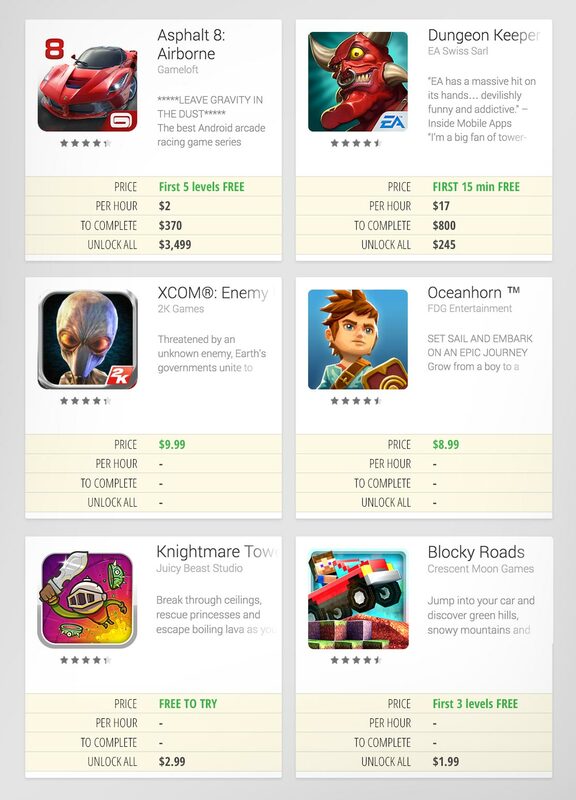 Take a game like Asphalt 7, which I wrote about in 2012. You can download it for free, but after just a few levels you can't win a race anymore without paying for various upgrades. And to unlock all upgrades you will end up paying roughly $3,500. Offering that as a 'free game' is a lie. It's the same thing about Dungeon Keeper, which I wrote about in my other article. It's not a free game, it's a free wait. 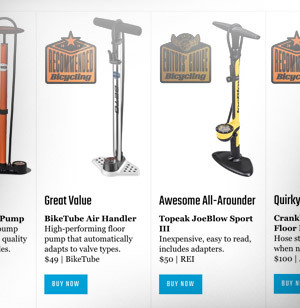 Note: These are not accurate prices. It's just a concept illustration. This is the real problem right here. The only reason why companies like EA can get away with what they did to Dungeon Keeper is that they can hide the real cost of playing the game. If they were forced to be upfront and honest about how their in-app purchase system is interrupting the game play, nobody would ever download the game. And I think it's only a matter of time before various Government consumer watchdogs (like the FTC) will force game developers to do this. We are already seeing how things are starting to happen in the UK, and it will surely be required in other countries as well. Remember, this is the law in many countries. And it's especially true in Europe, where finding new ways to annoy Apple and Google is a hobby for many EU politicians. It will be a massive vote winner for any politician who forces the app stores to implement new 'transparency' rules for in-app purchases. And as a game developer, do you think that you could continue to offer in-app purchases when this happens? If you have to be upfront about the real cost of *playing* your game in an uninterrupted way, would people still download them? Actually, let me take this a step further and illustrate what the app store would look like if you compared the real cost of different games. Take a look at the game page below. Which games would you download? The two top ones, both based on in-app purchases, suddenly no longer look that attractive. All the other games, both the two full games in the middle and the freemium games at the bottom, look far more attractive when you are being honest about the cost. What exists today is not a sustainable model. It works as long as you can get away with it, but in the long term you are creating a product that will eventually kill your business. The question is what will cause the current model to break? Will it be the Consumer Watchdogs and the politicians, demanding more transparency and an end to deceptive pricing information? Will it be Apple or Google who realizes that it's not good for business to keep offering in-app purchases that are designed to be detrimental to people's game play? Will it be a social movement, in which a few key game studios use their influence to create a real social backlash that other gaming studios can't ignore? I have no idea. From a trend perspective the market is just about to break apart. The level of negativity towards scammy in-app purchasing tactics are simmering to the very brink of erupting. It's not easy to solve, though. Another concern that game developers have is that it's almost impossible to stand out. As one developer wrote to me, the reason why they are doing it the wrong way is not really about greed. It's about just staying in business. I understand that point of view, but you also have to realize that it's a self-inflicted wound. The reason why we have this level of abundance is caused by the deception of in-app purchases. If all games had to be upfront about the real cost of playing their games, 90% of all the in-app games would no longer make any money and would disappear. It's the deception that makes this abundance of games possible. And the more you optimize for this deception, the worse it gets. It's killing the industry. This is in no way unique to the gaming industry. We see exactly the same in most other content based industries. Look at online sites, newspapers and magazines. Look at Demand Media? It's a company that tries to deceive people by pretending to make usable articles but is in reality just making keyword optimized junk. It's behind sites like eHow, who produce keyword rich articles that contain practically no real information. What happened to them? Well, for a while they made a ton of money (which caused many others to follow them), but it was a short term strategy. And soon, the market (for them being Google) changed their systems and practically ran them out of business. You can read more about this in Variety's "Epic Fail: The Rise and Fall of Demand Media". Companies like EA, and many other gaming studios, are currently acting exactly the same way as Demand Media. They are no longer making real mobile games. Like Demand Media, they are designing something that only looks like a game, but isn't. Instead, it's a hyper-optimized, socially engineered tactic designed to exploit a momentary loophole in the system. Demand Media also attracted quite a staggering amount of traffic. And for a while everyone believed that Demand Media's tactics were the only possible future. But look at where they are today. 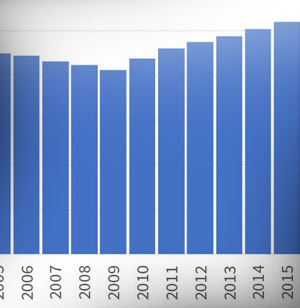 Now look at the current state of the gaming industry Do you see the trend here? Do you see what it's doing to your future. Do you see the pattern repeating itself? With all this in mind, one might wonder why the bad in-app practices haven't failed yet. The answer of course, is that they already have. The shift away from these tactics is already in full swing. Not from a developer perspective, but from a user perspective. But, wait-a-minute", you say, "that's not true." "When we look at our download, traffic and revenue graphs, they all show that in-app tactics not only bring in more people, but they also bring in more revenue. Clearly people still dominantly prefer this over having to pay upfront or the old free trial systems. Well, here we see the classic mistake that so many companies have made. They think that the desire for change is only happening when revenue starts to go down. It's the old "don't fix what ain't broken", or the Wall Street equivalent of "don't cannibalize what's still growing". But this is how change works. 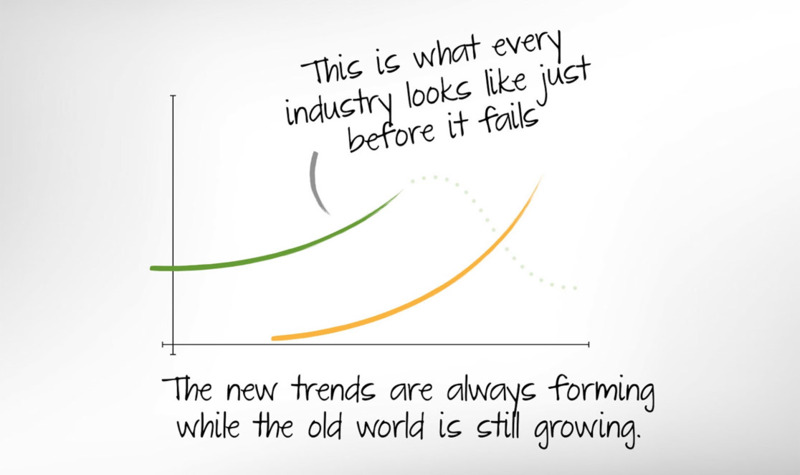 The time when people want change the most is when demand for the old world is booming. I illustrated this last year with this graph. This is true for all types of industries. The car industry emerged when the demand for horse carriages was booming. The desire for digital cameras happened while Kodak was still experiencing strong growth. The desire for ebooks happened during a period of increased desire for printed books. And think about the feature phones. The iPhone came out when the demand for feature phones was booming. People don't demand change when things are starting to slow down. Because at that point, people have lost interest and can't be bothered. People want change to happen when the old world is still growing. And this is exactly the trend we see with how people respond to in-app purchases. The demand for change started happening a long time ago, and the frustration with the game studios for not listening have been increasing ever since. What we are seeing today is not the beginning of a new trend. We are looking the end of it. People want the gaming industry to change and to refocus on value. But because they are not listening, people are now losing hope instead. The result is what I saw when I posted my other article. Many people were angry, but a lot of people simply said: "This is why I no longer play games on mobiles". The shift has already happened, but you didn't listen, so now people are losing hope. The dilemma is, of course, that if I tell this to companies like EA or Gameloft, they will think that I'm nuts. How can I can say that the shift has already happened, when both their traffic, number of downloads, and revenue are increasing with these in-app games. Surely, that's where the future is? But you are not listening to your market. In recent years, I can remember three other companies who also refused to listen to their markets while their revenues were growing. One was Kodak, the others were Blockbuster and Borders. Kodak for instance, was experiencing a tremendous boost exactly around the time when people wanted it to focus on digital. But, being blinded by this new level of growth, it completely missed the signs that were all around it. And by the time it finally started dropping, it was too late to do anything about it. It had lost its most important group of customers, its first-movers. So think of companies like EA, and how it made Dungeon Keeper for iPad/Android. It's based on the principle of pretending to give something for free, but it is instead a socially engineered cover-up for not telling people about the real cost. Stop treating your customers like human piggy banks, and don't put out so many incomplete and/or broken games with the intent of getting your customers to pay extra for what they should have received in the first place. It has been the target of several social backlashes across its product portfolio. And after I posted my article, quite a staggering number of people commented, "What else can you expect from EA?" Do you really see a future here? Do you really see this as a sustainable business model for years to come? Do you really think you will be able to continue this as the future path of mobile gaming? From a trend perspective, what we are looking at here is a mobile gaming industry that has already failed. Yes, these tactics still make more money but that's besides the point. It is making this money at the expense of its own future. Obviously, we can't fix this by just going back to the good old world. We need in-app purchasing because it's a vital part of the dynamics of mobile gaming. Not the way EA and many others are doing it, but mobile is a very different gaming environment from gaming on our other devices. If you asked people who were playing games on a PC, XBOX or PS4 if they considered themselves as 'gamers', most people would probably agree that they were. Gaming on these devices is something you decide to do. For instance, playing Assassins Creed IV on the XBOX or XCOM: Enemy Unknown on the PC is something you sit down to do. And you are likely playing for hours at a time without interrupting yourself with other tasks. If you were to ask a random group of iPhone owners if they consider themselves to be gamers, most of them would say "absolutely not". They are still playing games and all of them have a number of games on their phones, but they don't consider themselves as gamers because they rarely dedicate their time for gaming. Playing games for them is an activity they do in-between other tasks. They play games while waiting for the bus. They play games while watching TV. They play when they have a moment, or are waiting in line at the grocery store. 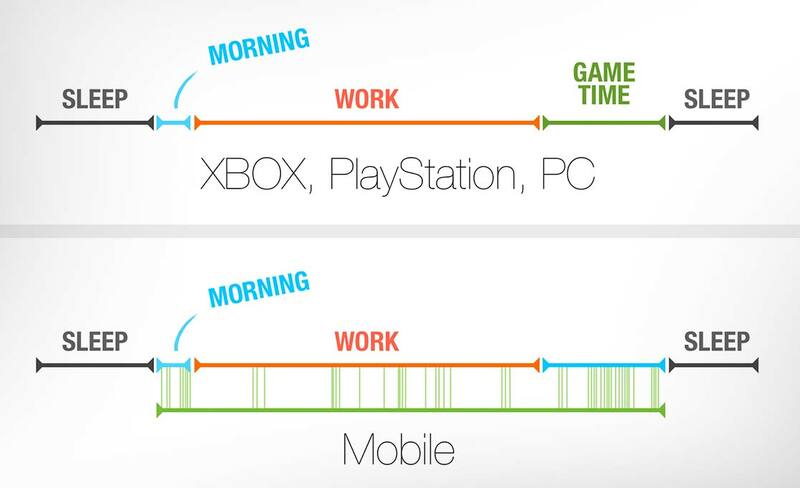 Because of this, mobile gaming is very different from its desktop and console counterparts. As a gamer, I make a decision to play. It's a primary activity. For mobile gamers, people don't decide that 'after dinner I'm going to play this game'. It's just something they do when they feel like it. Sure, a mobile gamer can use up an enormous amount of time playing a game, but it's never a dedicated decision. This difference between player and non-players has a tremendous impact on everything. It affects the type of game, the scope of the game, the length of each level, the snackability, the ease of jumping in and out of it at will... and also how we can make any money from it. 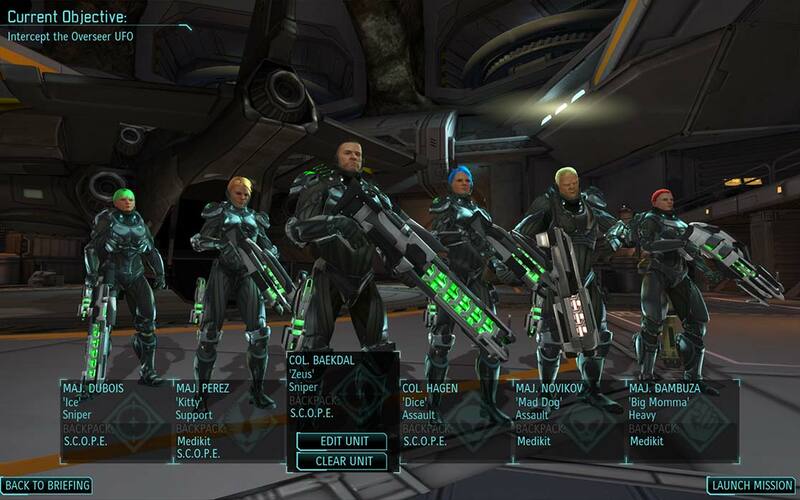 Take a game like 'XCOM: Enemy Unknown', which was also made for the iPad. It's a wonderful game, but it's designed exclusively for gamers. It something you have to dedicate yourself to. You can't play it while waiting for the bus or when you have a moment. Because not only is each level fairly long, you also have to remember what the mission parameters were. Non-gamers would never even consider buying this game. So for this game, the upfront full game price is the perfect model. This game couldn't work if they tried to do it with in-app purchases because it prevents people from dedicating themselves to it. On the other hand, games like Angry Birds are designed for the non-gamers. It's something you can play quickly, whenever and wherever you are. Each level only takes about a minute and it's completely up to you how long you want to spend on it. Angry Birds is so well-known that they can do whatever they want. But for a similar type of 'snackable' game you would never be able to sell it by asking people for money upfront. You have to give people the ability to start playing without making a decision, and then down the line expand that experience with 'extras' once they have gotten to know you. So as a game developer, you first need to figure out who you are. Much of the confusion and annoyance around in-app purchases exists because the games don't know what behavior they are targeting. It's not a question of one or the other. 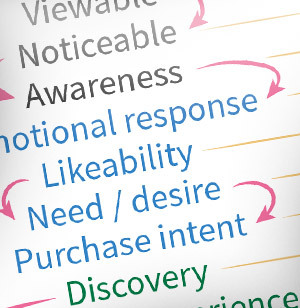 It's question of what type of behavior you are targeting with your games. How can you make snackable games that make sense? Games that people don't really play as gamers, but are merely a form of entertainment whenever they have a moment? The first mistake that many make is that they think the solution is to make it shallow, and they dumb it down. This is a very common mistake across the entire content industry. 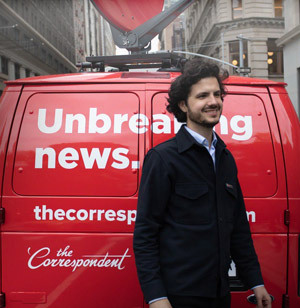 Take newspapers. In the past, newspapers were something that people would sit down with, perhaps for 20-40 minutes at a time. But when you look at news online, and especially on mobiles, nobody is going to sit down with the New York Times on their iPhone for any length of time. Instead, we now read news whenever we have a moment. We no longer decide to read the newspaper, it comes our way through the day. Does this sound familiar? The mistake newspapers made was that they mistook snacking for shallowness. They believed that just because people no longer wanted to spend 20 minutes reading the paper, that this also meant that they were stupid. So they started to create shallow news instead of snackable news. But that's not what people want. What people actually want is 'smarter' news. We see the same with mobile games. In the past, people would sit down with a game for an extended length of time, but in today's mobile world people predominantly snack on games. But don't mistake that with people wanting something dumb and shallow. What people actually want is something that is smart that they can entertain themselves with. Secondly, the biggest issue today is that the mobile gaming industry has an image problem. Years of scandalous behavior around in-app purchases has eroded all levels of trust. So a key element for creating a new future for mobile gaming is to restore this trust. You need to be transparent, honest, and authentic about what you do. And you demonstrate that through both the way you communicate with people, but also in what you offer. If you are going to offer people a 'free game' in order to attract the non-gamers (which is what you need to do), you have to actually give them that. Give them the ability to actually play the game in a completely uninterrupted way, from start to finish, for free! But, how can you make any money from that? Well, that's where in-app purchases come in. Not the kind we see today that are designed to lie about what you get and obstruct your ability to play, but the kind that expand the story, give you alternative paths, and generally expand your gaming universe. Imagine that this is a visual representation of all the different paths people can take through your game. What you offer for free is the orange path. And as you can see, people can play this path without obstructions or delays all the way to the end. But throughout this 'story, they encounter other characters and other paths that people can take, all of which are an added extra that people can pay for to extend their experience. This is where good game design comes into play. If you design this like a closed path in which every alternative road is blocked off, people are going to get angry because they are restricted and blocked off from actually playing. But if you design it to feel open and you communicate the additions in an honest way based on their value, people will want to pay for them because they know they are getting something extra of value. One example is Kinectimals (which wasn't free, but stay with me here). The main game takes place with a number of key animals moving through a path across an island. So the extra elements could include allowing people to take different paths, across other islands, featuring different animals, player houses and equipment. This is a great example of how to do it right, and how to extend what you offer with in-app purchases based on a concept of honesty. But this expansive model also opens up another very interesting concept which the gaming community have been talking about for a while now. It's the 'access model'. The idea is that instead of constantly annoying people with in-app micropayments, you will offer people a full-access subscription. Every month people will be charged a specific amount, but in return they get totally free access to all the characters, all the storylines, all the unlockables, as well as all future expansions. Obviously, this would only work for games that are specially designed to create a continual expansive gaming experience (of which there are almost none today), but it's a very interesting model. Not only is it based on continually extending that value of your games (which is a billion times better than trying to use in-app purchases to slow people down), it will also allow you to build up a community around your games. It allows you to connect with people, even those who don't consider themselves gamers. We have the 'gamers' model in which you create games for gamers who want to dedicate themselves to playing a game. We have the more casual (but smart) model, in which you design games that are offered for free, but enhanced (in an honest way) with other things that add to the story. We have the immersive model, in which you create a game where people can pick and choose the level of engagement they want in a continuously evolving universe. Each one of these models has a great future. Obviously, each one also has different price ranges and market sizes, with the 'gamers' model being the smallest one since most smartphone owners consider themselves to be non-gamers. What we don't have is the current model that we see today. The model in which in-app purchases are designed to be detrimental to people's game play and function as a form of ransomware. Sure, it's currently the model that makes the most amount of money, but from a trend perspective, it doesn't have a future. As a game developer you now have a choice. Do you want to embrace the new future? ... or do you want to end up like Blockbuster or Kodak?